Skills and Abilities: Boxing skills he learned in prison and trained wrestler. 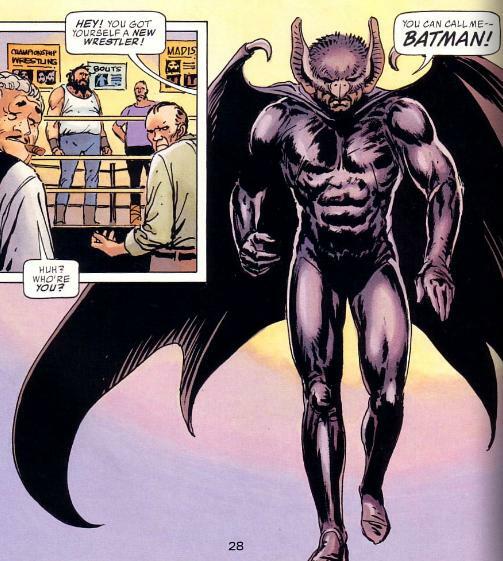 Powers: He has no innate powers but his costume grants him night vision lenses to see in the dark and into the infra red spectrum, Kevlar weave costume makes him bulletproof and allows for a degree of protection from physical attack, sensors to magnify sound and cape-like bat wings to glide on air currents. Wayne grew up the son of a policeman who was killed in the line of duty. As a young man he found himself set up for a crime he didn’t commit. In Prison he took up body building and boxing as a means of defending himself. Wayne also befriended a man named Grant who helped him hone skills such as sewing and business. While in prison his mother dies and he vows revenge on “Handz” the man who framed him. When the prison riots he saves the warden and is given a full pardon. Once free he is hunted by Handz so he adopts the secret identity of masked wrestler “Batman”. He never unmasks in public and goes on to become a major celebrity and very wealthy. Realizing he would need help to defeat handz he seeks out grant who he entrusts with his secret identity. Grant uses his technical skills to build him a better costume and equipment. Wayne then sets up Grant in a mansion and pretends to be his bodyguard so as not to attract attention. When Wayne finally finds hands and confronts him, he accidentally falls to his death. No longer seeking vengeance he starts a crusade against crime and becomes a symbol for the weak and innocent.